I'm proud to sponsor with Foster Farms Chicken for this post. It's a product I feel confident in using in my kitchen with a quality I've come to trust. All thoughts and opinions are my own. 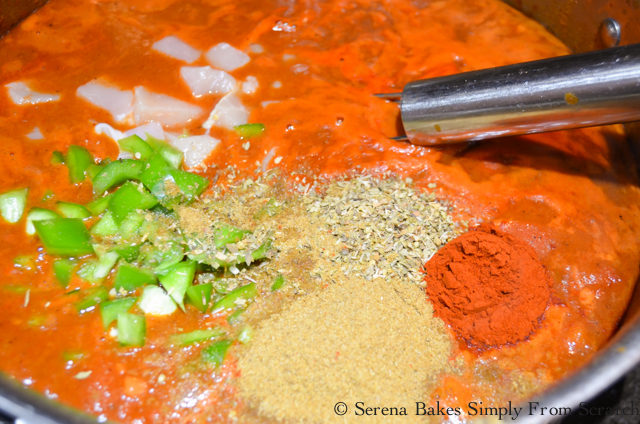 I've been craving Enchiladas lately so I decided to make Enchilada Soup, a healthier alternative to traditional Enchiladas. 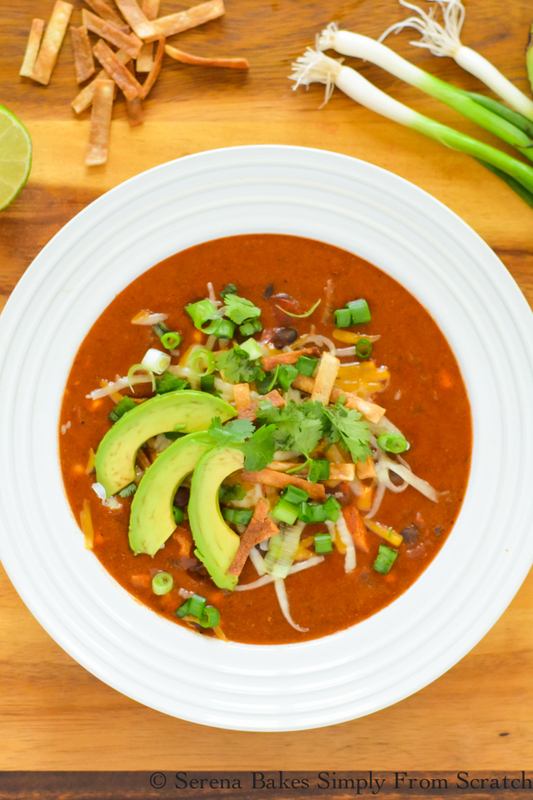 Two of my all-time favorite things just happen to be Enchiladas and Soup. It's the perfect new comfort food since it has all the things that make Enchiladas great, but with a healthier spin. I used Forster Farms Simply Raised Chicken Breast Fillets and black beans for plenty of protein. Masa Harina is used to thicken the soup so it's naturally gluten free. It's easy to make in under 30 minutes, and since the cheese is added as a garnish it's easy to control quantity. All the ingredients for the soup are kitchen staples in my house making this an easy dinner on a cold day. Enchilada Soup starts out with 1 1/2 pounds Diced Foster Farms Simply Raised Chicken Breast Fillets and black beans for plenty of protein. Masa Harina is used to thicken the soup so it's naturally gluten free. It's easy to make in under 30 minutes, and since the cheese is added as a garnish it's easy to control quantity. All the ingredients for the soup are kitchen staples in my house making this an easy dinner on a cold day. When I know we are going to have a particularly busy week I will even precook the chicken breast for multiple meals to save on time. I can then add the cooked chicken to salad, soup, or even to a grilled cheese sandwich. In a large soup pot add 3 tablespoons Extra Virgin Olive Oil, and heat until hot. Stir in 1 whole Diced Onion, cook until starting to caramelize. 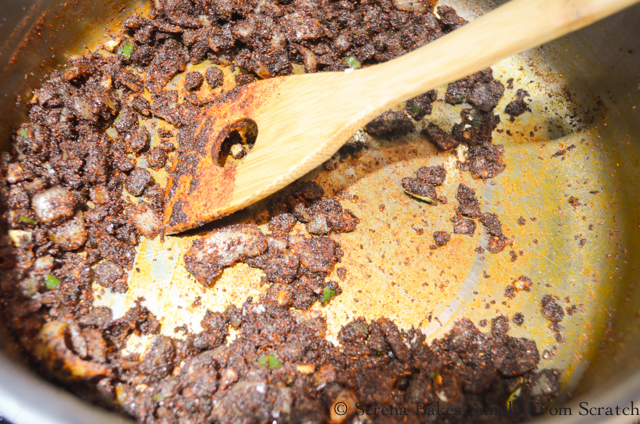 Add 1 whole Diced Jalapeño with seeds removed, and 5 cloves Minced Garlic, stir until garlic is fragrant, and softened. Stir in 2/3 cup Chili Powder, and cook for about 2 minutes, until fragrant. 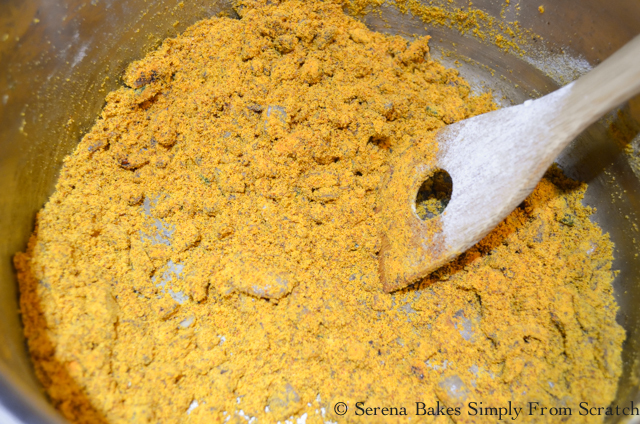 Whisk in 1 cup Masa Harina (Corn Flour), until well combined. Slowly whisk in 4 cups Chicken Stock, and 6 cups Water, until smooth. Add 3 whole Diced Chicken Breast, 28 ounces Fire Roasted Tomatoes, 6 ounces Tomato Paste, 1/4 cup Cumin, 2 teaspoons Oregano, and 2 teaspoons Smoked Paprika. 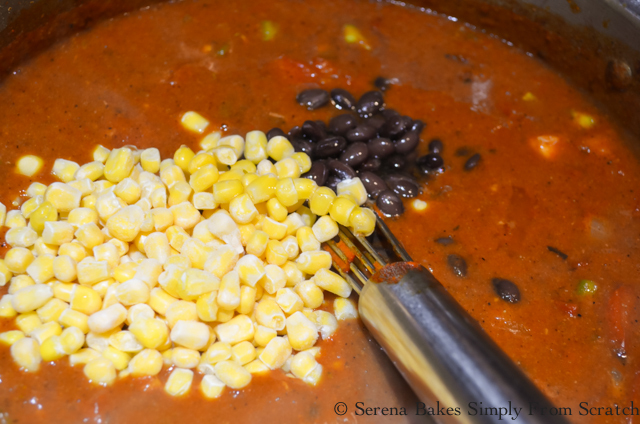 Stir in 15 ounces Rinsed Canned Black Beans, and 1 1/2 cups Frozen Corn. Bring to a simmer, reduce heat to low, and cook for 20 minutes. Serve with Shredded Cheese, Chopped Cilantro, Fried Corn Strips, Green Onions, and Sliced Avocado. Hot Sauce can also be added to kick it up a notch or two, if preferred. Another timesaving hack is to freeze any leftover Enchilada Soup in individual serving sizes for an easy lunch or dinner when needed. An easy one pot dinner done in under 30 minutes makes this a family favorite perfect for a busy weeknight. 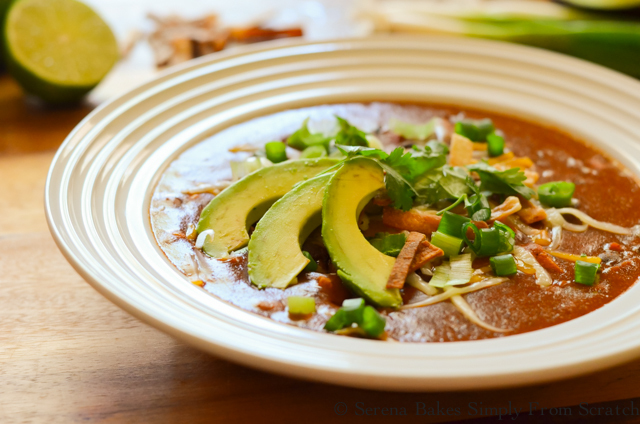 Enchilada Soup will quickly become a new favorite comfort food. 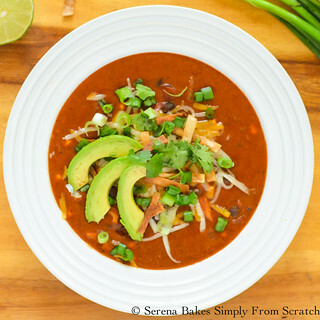 Enchilada Soup from scratch is easy to make with most ingredients found in the cupboard. No canned enchilada sauce needed. In a large soup pot over medium-high heat add oil. 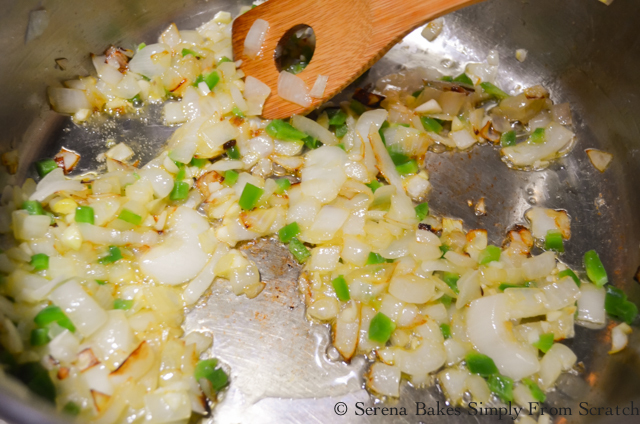 Once oil is hot add onion, and cook until caramelized. Stir in jalapeño, and garlic, cook until softened. Add chili powder and cook for 2 minutes, or until fragrant. Whisk in masa harina. Slowly stir in chicken stock, and water to prevent lumps. Add diced chicken, tomatoes, tomato paste, cumin, oregano, paprika, black beans, and corn. Bring to a simmer, reduce heat to low, and cook for 20 minutes, or until ready to enjoy. 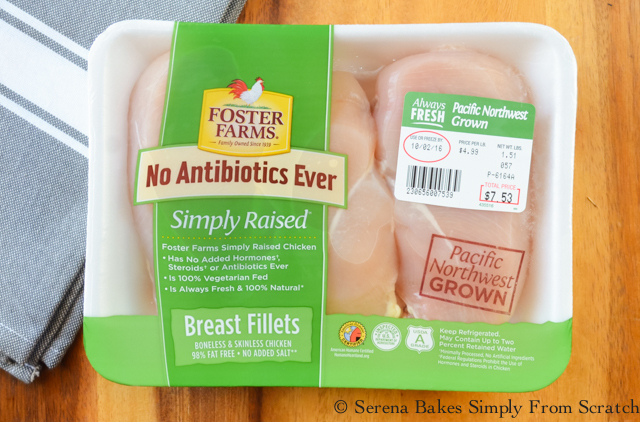 This is a sponsored post written by me on behalf of Foster Farms Simply Raised Chicken. This looks fabulous! We LOVE enchilada soup. I like the addition of the masa harina. I want to try that.